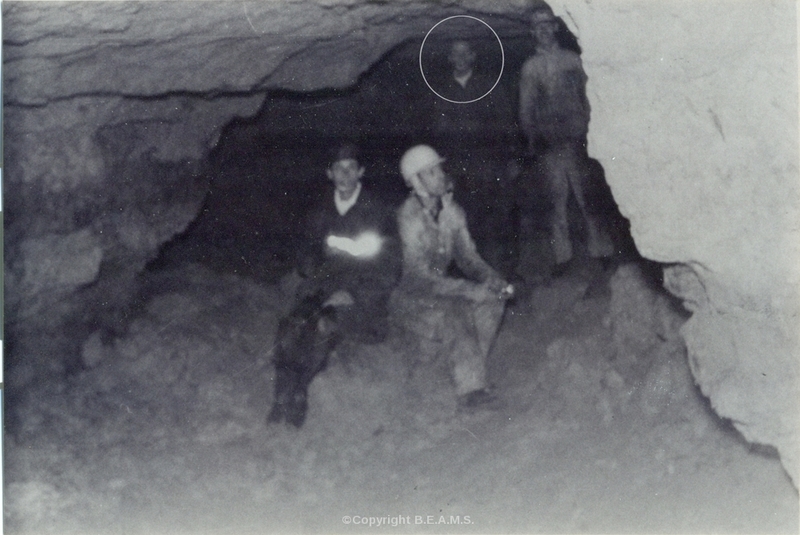 Above is a genuine picture of the 'spirit' extra of a 'caver' or possibly a miner - taken some time during the 1960's, Surrey, UK. (Please click to enlarge). The person sitting front-right was a family friend named George, and he gave me this interesting old photograph; George explained to me that there were only four members in his caving expedition (three of whom are in this picture and one taking the photo) he had no idea how the fifth man, (highlighted by a circle back-left) got into the shot, as there was absolutely no one else around at the time this was taken. George said that when he picked his photographs up after processing - he had "quite a shock" to see this mystery figure "posing for the camera as bold as brass"; and apparently 'he' was in none of the other shots taken in the cave entrance either. Note also how the mystery person is not wearing a protective hat; cavers always wear a hard hat with chin strap to protect the head from jagged rocks and possible falling debris. In my opinion it is impossible for this to be a double exposure, as the unknown person is so tightly positioned next to one of the cavers... and like George said, it's as if he's "posing for the camera". Of course, we tend to automatically label these photographic apparitions as 'ghosts' or 'spirits', but it is perhaps worth considering that some so-called 'ghosts' might be the result of another kind of little understood phenomena; such as residual human memories which somehow become imprinted, (recorded) into the area space of our environment; like a loop of film that is replayed when certain, (psychic?) criteria are fulfilled, such as this grouping of like minds? Yet this hypothesis only really works when a 'ghost' is seen in real time, by the naked eye - or captured on video. If what we are discussing here is simply some kind of dumb 'ether recording', (for want of a better term) how could this figure have presented itself on a still photograph at all? and so carefully positioned as well... implying that the figure had sentience?